Borobudur Temple is the biggest Buddhist temple in the world, which is impressive considering that it’s not in a Buddhist country but in Central Java, Indonesia. It’s a temple that ranks with Cambodia’s Angkor Wat and Myanmar’s Bagan as one of the great religious monuments of Southeast Asia. What is more remarkable is that it doesn’t seem to rank highly on the things to see in Southeast Asia. You’ll always meet someone in a guesthouse in Thailand who has been or is going to Angkor. Less people make the journey to Java. 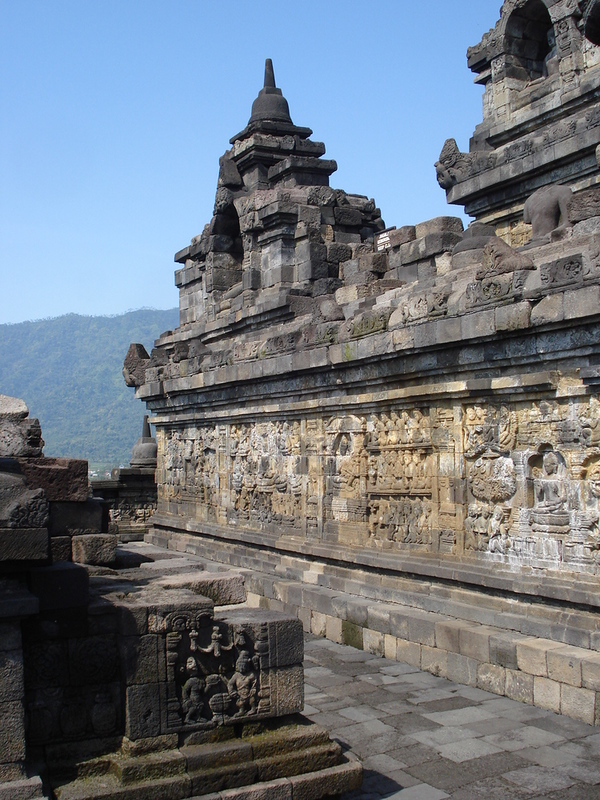 The temple is estimated to be built around 750-850 AD. 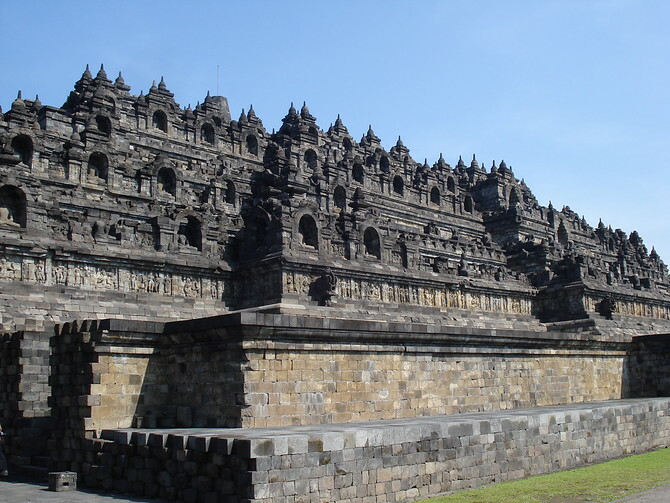 It was eventually abandoned as Islam spread through Java and then it was buried under volcanic ash. It was not until 1815, when Sir Thomas Stamford Raffles was Governor of Java, that the site was cleared. Restoration began in the time of Dutch rule in the early 20th century, and a full restoration was undertaken from 1973 to 1983. The temple sits on a 123m x 123m base and consists of 6 square terraces and 3 circular ones, rising up like a pyramid. When I arrived at the temple I wasn’t expecting it to be so big. Once you get up close to the temple it’s the detail of the carvings that overwhelms. After walking the first level, taking in both the size and attention to detail in all the carved panels, you really understand that this is one of the worlds great temples. You enter the temple from the east gate and walk around each terrace in a clockwise direction (as you do in a Buddhist temple). Each terrace is lined with carved galleries of fantastic detail. Upon completing the 6 square terraces you ascend to the first of the 3 circular terraces, where you will find over 500 Buddha images. There are 72 Buddha images contained inside latticed stupa’s, and some of the stupa’s are exposed to reveal the Buddha within. The temple is capped with one large stupa, bringing the temple to a height of 35 metres. At the top you can contemplate the valley below and the volcanoes Sundoro Sumbing and Merbabu Merapi in the distance. 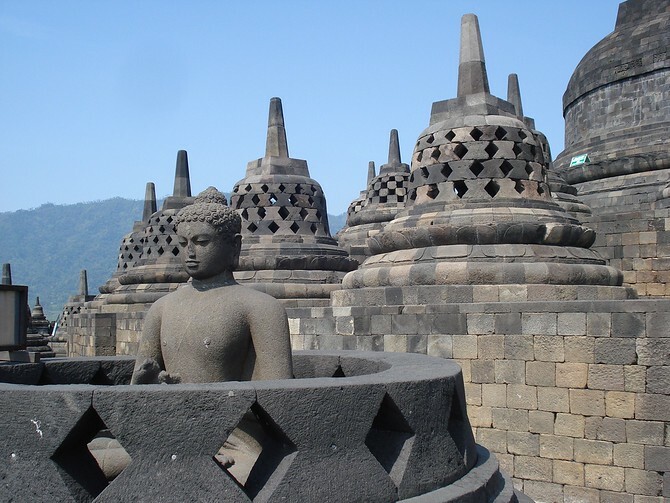 The most convenient way to visit Borobudur is by a day tour from Yogyakarta, which is 42km away. 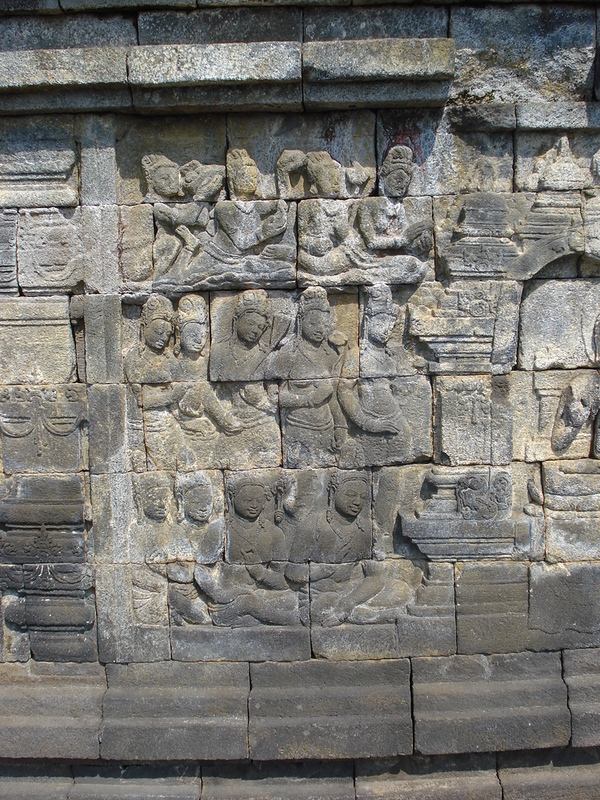 A day tour will also include other activities, such as a visit to the Prambanan Temple complex. If you wish to make your own way, there is a local bus from Yogyakarta which takes 90 minutes. 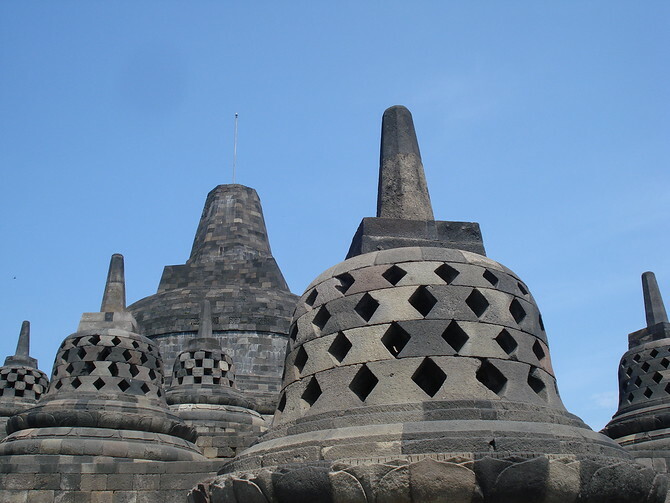 It is also possible to stay at Borobudur town at guesthouses nearby the temple. 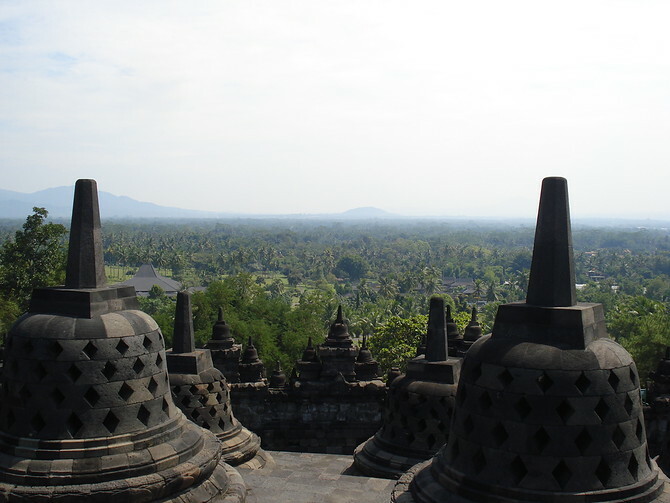 Another popular way to get to Borobudur and Prambanan is via a tour arranged from Bali. Given that Bali gets more visitors than anywhere in Indonesia, there of plenty of tour companies offering air or bus tours from Bali to Java. If you’re planning a trip to Bali it would be worth considering putting aside a few days to do a side trip to Yogyakarta. And for some general life inspiration read these Buddhist quotes.